Sinkholes aren’t exactly rare in Nova Scotia, but they're not common, either. You may remember a case in Falmouth that made headlines last year when the family lost their home when the earth simply opened up underneath them. In many ways, it was the end of a dream for the Strickey family, who were forced from their home when the ground underneath it began to give way. Uninhabitable, the place had to be torn-down. Oxford is the latest high-profile case in the province. In a little more than a week, the hole has grown dramatically, swallowing 40-foot trees, boulders, and other items. No one knows how deep it is or when it’ll stop caving in. Robert Ryan is the manager of mineral resource evaluation with the Nova Scotia Department of Lands and Forests and has a PhD in geology. He offered this explanation of how they occur. Scientifically speaking, that’s about all there is to forming a sinkhole: water relentlessly carving-out an underground cavern by dissolving certain rock or minerals. Salt, limestone and gypsum are usual culprits in Nova Scotia, but one in particular stands out. “In Nova Scotia, probably 85 per cent of the sinkholes are in gypsum,” Ryan said. When an old mine shaft caves in, we tend to call those sinkholes, too, but geologists say that term is reserved for the natural phenomena Ryan described. Sinkholes are certainly not unique to our region; they turn-up in a number of areas around the world, often with disastrous results. Knowing the geography of an area where you intend to build or buy a house is helpful, but there are no guarantees you'll never have to deal with a sinkhole because they're nearly impossible to predict. Still, in a case like this, knowledge is power. Scientists continue to monitor the situation in Oxford and are hopeful it will stabilize sooner rather than later. Filling it in might never be feasible. “You could put material in there, but, chances are it’ll end up down in the river,” Ryan said. Ryan says, to his knowledge, no one has ever been hurt or killed by an active sinkhole in this country, but you only need to look at the Falmouth situation to see the damage they can do. Just ask the Strickey family, who lost their house and had to relocate. 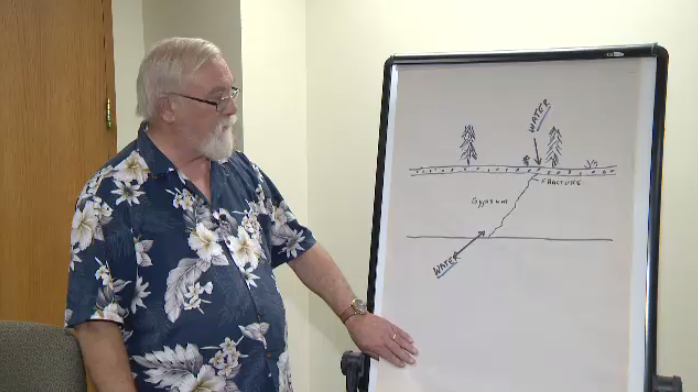 Robert Ryan, who has a PhD in geology and is the manager of mineral resource evaluation with the Nova Scotia Department of Lands and Forests, explains how sinkholes occur.